Capture One Pro 10 is the latest iteration of the high-end camera maker Phase One’s digital asset management (DAM), raw converter and photo editing software. With Apple’s Aperture software now discontinued, Capture One Pro is positioned as one of the market leaders up against Adobe Lightroom and billed by Phase One as 'the Professionals’ choice in imaging software’. Key features include a claimed ‘exceptional’ handling of colour, customisable workflow, efficient performance, instant tethered capture, asset management and photo editing. I am a long time user of Adobe Camera Raw, Lightroom and Photoshop, with minimal experience of the more recent versions of the Capture One Pro software until this latest version. While this is a review of Capture One Pro 10 (and not a comparison test), there will be times where I draw quick comparisons and differences between these big players in the imaging software world. 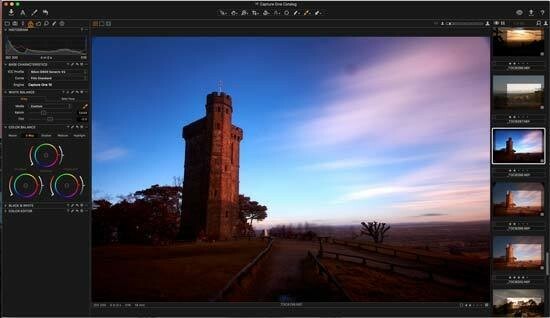 Improvements in this latest version of Capture One Pro are incremental rather than astronomical. Such levels of change are unsurprising in a well-established software, in part because significant changes run a higher risk of operational issues. Alongside the launch of version 10, Phase One and LogicKeyboard have created an official Capture One Pro Apple keyboard, featuring colour-coded keys with shortcuts and icons. The keyboard is available for 129 EUR + vat (www.phaseone.com). Capture One Pro 10 is available now for Mac OS X (10.11.6 and 10.2) and Windows (7, 8 and 10). It can be installed with ease via the Phase One website (www.phaseone.com). Click on the Download option in the toolbar for a free 30-day trial, with all features unlocked. Over 400 digital cameras are supported by Capture One Pro 10, with a list of all supported devices again on the company’s website. On the Capture One Pro 10 product page, there are three options for installation: Buy, Subscribe or Update. Such flexible choice is not available for the likes of Adobe Lightroom, which is part of the Adobe Creative Cloud subscription only service. To buy outright, Capture One Pro 10 starts at 279 EUR + vat. To subscribe, prices begin at 12 EUR + vat per month and to upgrade from version 8 or 9 it’s 99 EUR + vat. Prices increase for business packages where multiple copies of the software are required. On first opening the software, there are four ‘products' to choose from; Pro, Pro (for Sony), Express (for Sony and DB (for Phase One and Mamiya Leaf owners only), followed by three options; try (the 30-day trial), buy (purchase a licence code) or activate (input your licence code). This review is based on the Mac version of the Pro product, using a MacBook Pro Retina (early 2015) with 16GB memory, 2.7GHz processor and Mac OS Sierra 10.12.3 operating system.